Everyone knows about Yellow and Red cards in football. However, someone don't know that badminton also has that penalty cards. Yellow Card is used to warning for misconduct. Example: hitting racket on the floor, fist pumping. 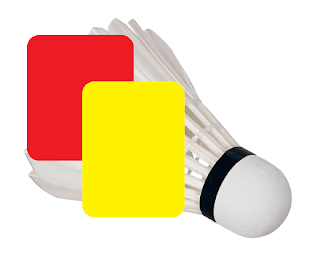 Red Card is used to punish fault for misconduct, flagrant or persistent breach of badminton law. Players will be minus their scores after received Red Card. Besides, in badminton match, the umpire may use Black Card to disqualifica a player.